For other uses, see Szarvas (disambiguation). 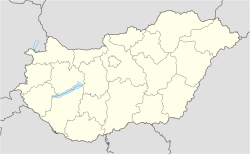 Szarvas (German: Sarwasch, Slovak: Sarvaš; IPA: [sarvaʃ]) is a town in Békés County, Hungary. Placename Szarvas originated from the old Hungarian word szarvas, which means deer. Deer also can be found in the coat of arms of the town. According to the Hungarian Royal Treasury (Hungarian: Magyar Királyi Kincstár) it was an ethnic Hungarian town in 1495. The Medieval town was ruined due to the Ottoman wars, native Hungarian population fled from the area. It was uninhabited until 1720, when Austrian baron Johann Georg Freiherr von Harruckern (György János Harruckern) invited mainly Slovak settlers from Upper Hungary to the deserted area. They built a brand new town by the help of Sámuel Tessedik, who invited engineers to plann the town. Tessedik also established the first agricultural school in Hungary. Lutheran church was built from 1786 to 1788, the Roman Catholic from 1808 to 1812. Town hall was built in 1820. Hungarians overtook Slovaks in the 1920s, become the majority according to the census was held in 1930. Since 1990 Szarvas is home to the Ronald S. Lauder Szarvas International Jewish Youth Camp (Hungarian: Szarvasi Nemzetközi Zsidó Ifjúsági Tábor). According to the 2011 census the total population of Szarvas was 16,954, of whom there were 14,325 (84.5%) Hungarians, 1,822 (10.8%) Slovaks, 489 (2.9%) Romani and 75 (0.4%) Germans by ethnicity. 15.4% did not declare their ethnicity, excluding these people Hungarians made up 99.9% of the total population. In Hungary people can declare more than one ethnicity, so some people declared a minority one along with Hungarian. In 2011 there were 4,531 (26.7%) Lutheran, 2,601 (15.3%) Roman Catholic and 708 (4.2%) Hungarian Reformed (Calvinist) in Szarvas. 4,087 people (24.1%) were irreligious and 200 (1.2%) Atheist, while 4,601 people (27.1%) did not declare their religion. ^ "Historical Centre of Hungary and Memorial Track - National Parks". About Hungary. Hungarian Tourism Ltd. Retrieved 29 September 2014. ^ "Geographical center of Hungary". Chesereu Reformed Church. Retrieved 29 September 2014. ^ "Arboretum of Szarvas, Szarvas, 5540 Hungary, 46.876976, 20.536938". Google Maps. Google. Retrieved 29 September 2014. Wikimedia Commons has media related to Szarvas.